Mr. Waterlow, the generous guy who made this piece of land a park. Located just off Highgate hill and one of a few greenspaces in the area, Waterlow Park is one not to be missed for a wander. 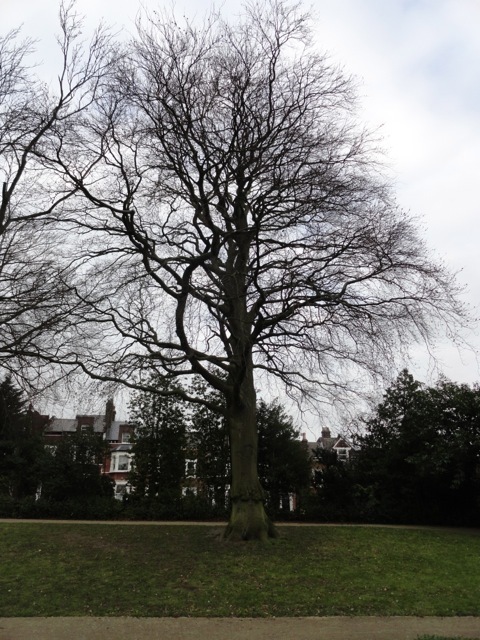 The park is in Highgate in northern London just next to Highgate Cemetery and Hampstead Heath. The park has been fairly recently restored by the local council. I walked into it, knowing little of it’s history, but was pleasantly surprised. 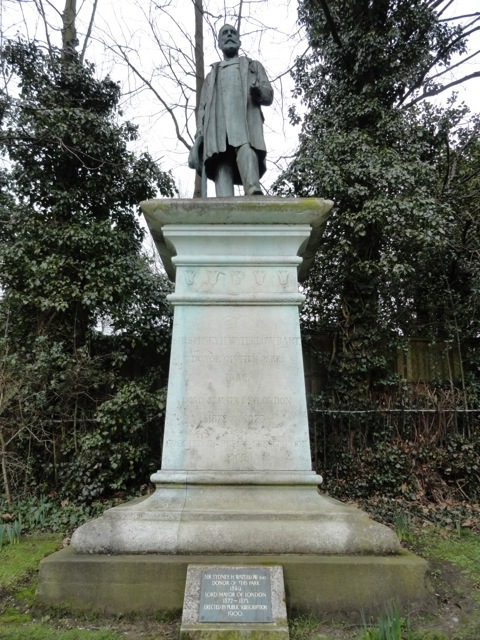 It is a grand, late Victorian park, a gift from Mr. Waterlow to London County Council. The park contains a few houses which pre-date the creation of the park. For me, I visited on a cold, dreary Leap Year February 29th. 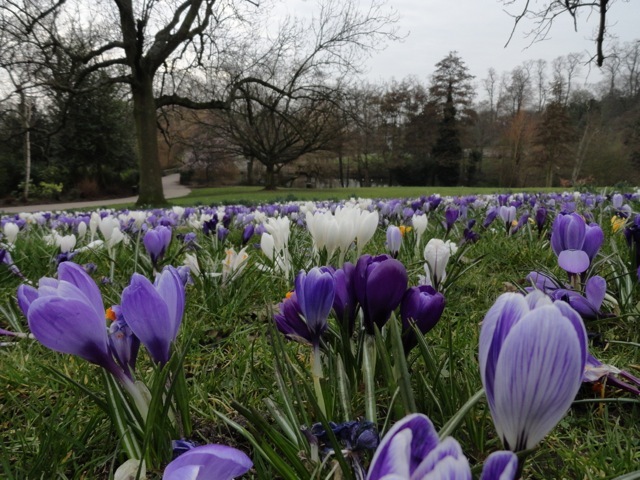 But the crocuses, snowdrops were in full force and a couple of cherry trees were beginning to flout their early season blooms. It reminded me that the grumblings of Spring come early here in the Southeast of England. It’s one of the things I love most about living here in London. fter spending so many of the past 12 years of my life living in the desert, where the Spring is a weekend sometime in the Middle of May. Here it’s 3 months of watching all the shades of the rainbow re-appear in shrubs, vines and trees after a Winter slumber in fantastic fashion. 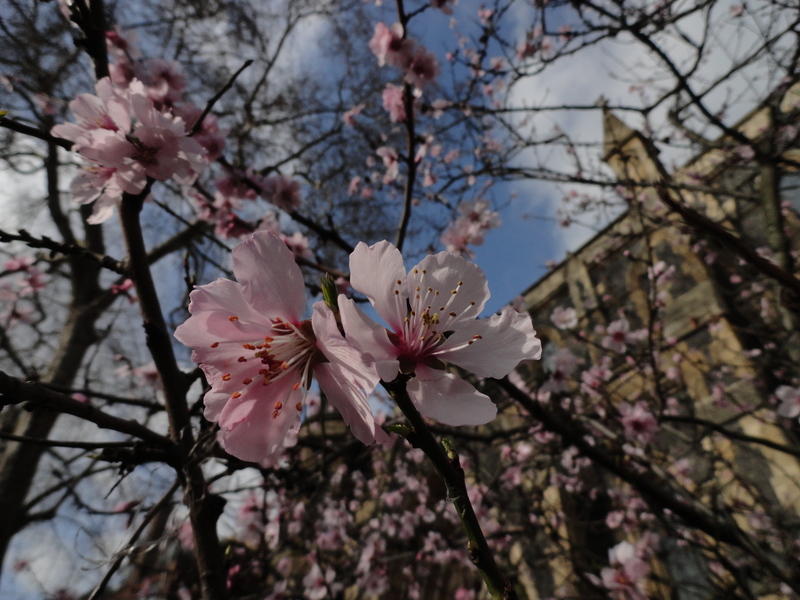 Yey, Spring is on it's way! to spend the time to see the whole property. I was most impressed with the water features, which are fed by natural springs. There’s a bit of a bowl area going down to one of the ponds in the park. 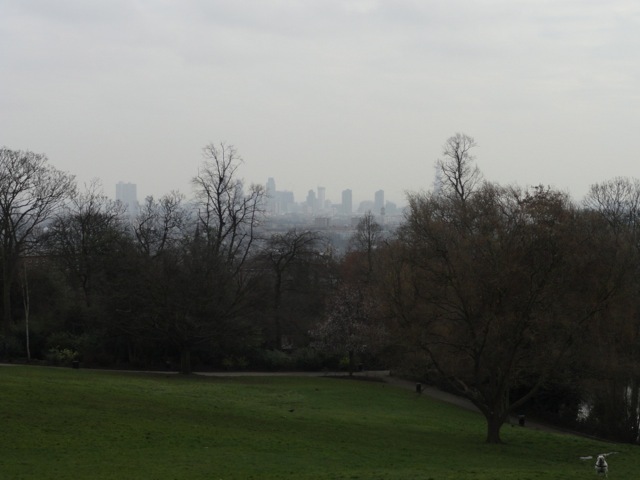 From the top of the bowl, you can get a glimpse of the central area of London over the top of the trees. As far as trees are concerned, there’s a fantastic mix of trees, including some really nice Scots Pines (Pinus sylvestris) on the Northern wall of the park. Of course I didn’t get any good pictures of them as it was an after thought to take pictures for this series of posts. You’ll just have to go there yourself to see them. My favorite tree on the property was a big Copper Beech (Fagus sylvatica) which looked like it had some serious damage to it about 3 feet up from the bottom. I have no idea what the history of the tree is, but it looked good and had overcome the stress to become a prominent figure in the space. Good job, Beech. I took a quick stroll by the Lauderdale House which houses a small cafe. Out in front of the house is a lovely little formal garden. 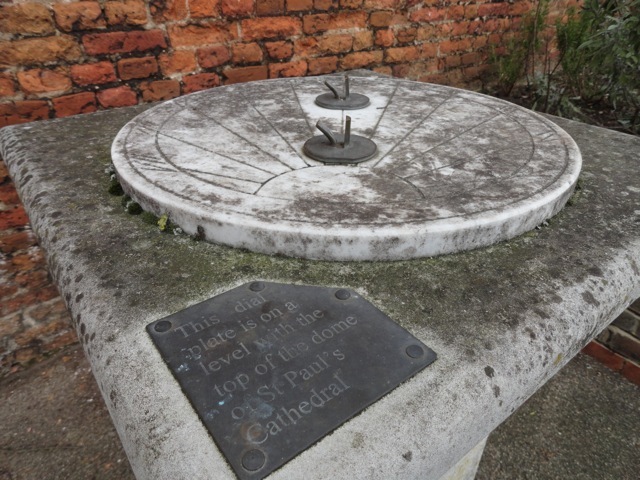 And my favorite bit was the sun dial in the garden, which was at the same elevation as the top of St. Paul’s Cathedral in the city. It’s quirky little monuments and installations like this, which make certain parks worth multiple visits or dragging other people to experience. 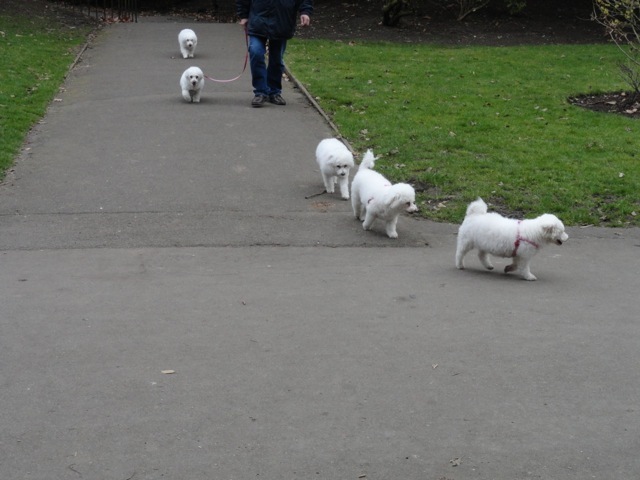 On my way out I spotted a guy walking a load of dogs. Literally a load. And all of the same breed. I think they were bichon frise? Any ways, it made for a memorable moment to see them all walking in a line on their way to a nice afternoon in the park. Lucky dogs to get walked in such a park. So if you do happen to make your way to Hampstead Heath or Highgate Cemetery, make sure to make a small trip through Waterlow Park. You’ll be glad you did. I”ll leave you with a couple more pics of the park. Enjoy and welcome Spring! Life is frantic! Non-stop crazy times here at the moment. Had a couple friends in from the states this weekend. Really good time. But I didn’t get my weekend time to recharge my life batteries. Compounded with excessive drinking, well, yeah. I should feel a lot worse than I do, so I won’t complain too much. And as I always have to remind myself, I will remember the excellent times spent with people or doing things and I will forget about how exhausted I was the next day. I’m done with work on Friday, so I will have a bit more free time. I say a bit as I’m still going to be working on other things and also preparing for another round of visitors. Pretty nice how many people I get to see and I don’t have to go any where. This weekend I will attempt to get a couple parks and gardens updates in as my pictures are becoming obsolete to some extent as spring has decided to show up! All of the flowers and tree blossoms are pretty fantastic and I want to share it all with you. On that note, I leave you with a lovely picture from this weekend when my friend Ali and I were at Borough Market. We stopped for a bit and had some farmhouse cider outside Southwark Cathedral. A friendly reminder to check out my previous post about sending me questions about what to write about. I’ve already received a few and they are pretty good. Keep them coming! Hi everyone. I think I had a half decent idea on my commute home the other day in regards to this blog. There are a lot of regular readers to the site. I know this because I see the site stats. Literally 10s of you make it a habit of checking back to this website. And I am completely flattered that you would like to read my mindless garble. So to get more of you involved in the blog have a proposal: Ask me. Ask me whatever. What do you want to read about on this blog? What would you like to know about me? What would you like to have my lovely opinion on? I’m going to give you a week and a half (March 18th) to consider it and write a comment on the blog or email me. I’m going to choose 5 questions from the submissions. Maybe I’m being brazen thinking 5 people would want to ask me something, but I don’t think so. I am willing to be pretty open if you want to ask me something personal. But I will draw a line, so nothing greater than R rated, please. I’m looking forward to your questions and suggestions. Thanks guys. Get to it! 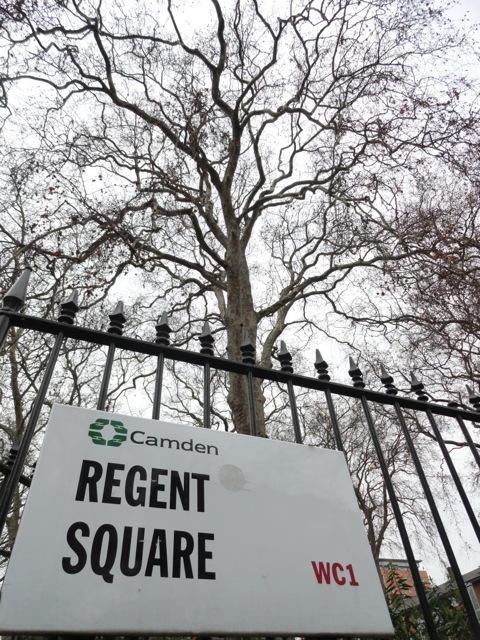 Tucked off busy Gray’s Inn Road, just to the south of King’s Cross/St Pancras Stations in the heart of London is the small square Regent Square Garden. It was named after Prince Regent who eventually became King George IV. The square is not on the way to anything in particular, so unless you’ve done a proper wander around the Congestion zone, you’ve probably missed it. There’s not much in the way of garden. Just some grass struggling to be truly lush and green and a few shrubs dotted along the perimeter. 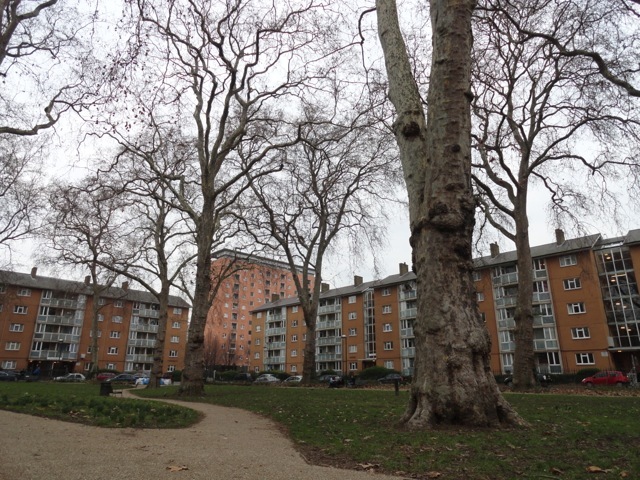 But you have to forgive the lack of understory due to the presence of some massive, towering London Plane trees (Platanus x hispanica) . 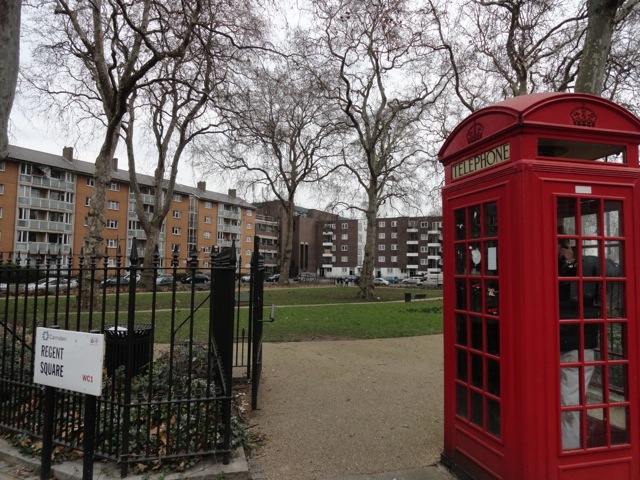 The square contains 12 planes, which judging by it’s history and this size of the trees, must be about 175 years old. The square was created in the 1820s and was originally surrounded by two churches, one of which was severely damaged in WWII by a V2 bomb. Both apparently were demolished to make way for the brilliant architectural masterpieces of 1960s architects and planners (note sarcasm). Note lovely housing estate in background. feel when their under the canopies of such fantastic trees. It’s a enveloping sense of nature. Even in the dead of winter, when only a few scraggly leaves remain on the branches high above, the Planes are an overwhelming presence, but also calming. I couldn’t see any sign the trees had been pollarded, but the trees had been lifted quite a bit. With all of them competing for the limited resources in the square, there’s not enough room or light to develop a full canopy, but no matter. They are still gorgeous trees. So if you’re ever around St. Pancras and need a break away from the madness of Euston Road, wander down here. I know once the leaves are back on the trees, I’ll be back to take some more pictures and enjoy the splendor that is the London Plane.